Crockpot Corn Chowder is the perfect soup for keeping you warm, filling you up, and tasting delicious. Full of corn, potatoes, and vegetables and topped with crispy bacon each bite gets better and better. As the temperature drops, nothing warms you up like a bowl of homemade soup! 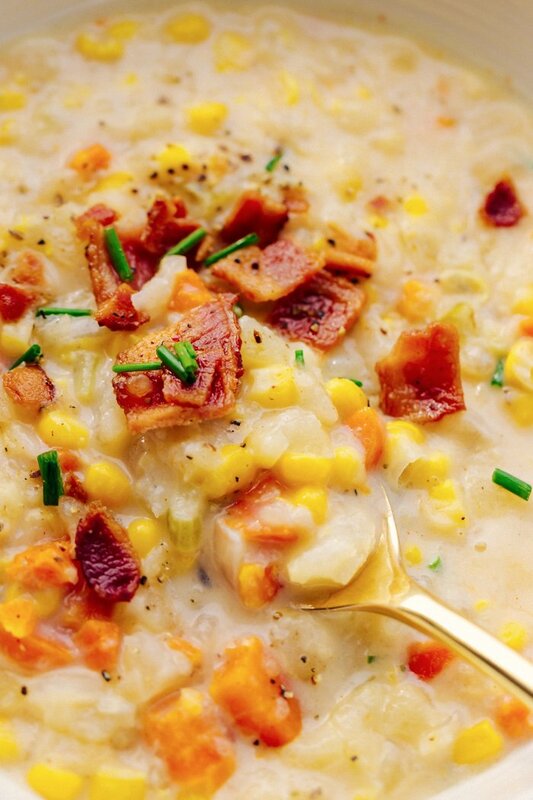 And this hearty crockpot corn chowder will definitely do just that. Cooking with a crockpot is so magical. 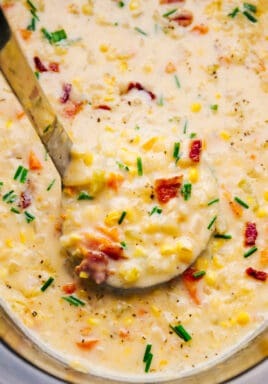 It literally helps take away the time spent cooking and says “let me do that for you.” This corn chowder recipe is one of our favorites and has the perfect texture and flavor that you will love. 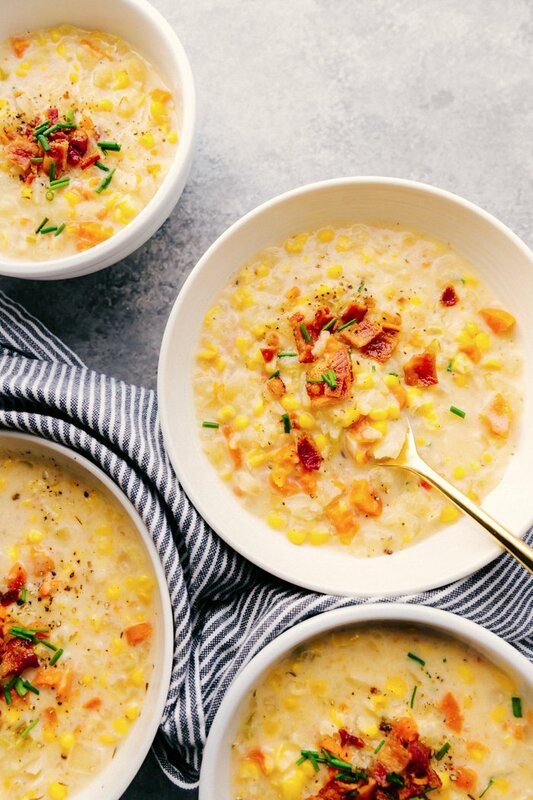 A hearty blend of vegetables, potatoes, and corn, topped with crispy pieces of bacon makes this corn chowder amazing. Corn chowder is a soup that uses corn as its main ingredient and is often times accompanied with onions, celery, milk, potatoes and chicken. How Do You Make Corn Chowder? Sauté chopped carrots, onions, and celery for 5 minutes until vegetables are tender. 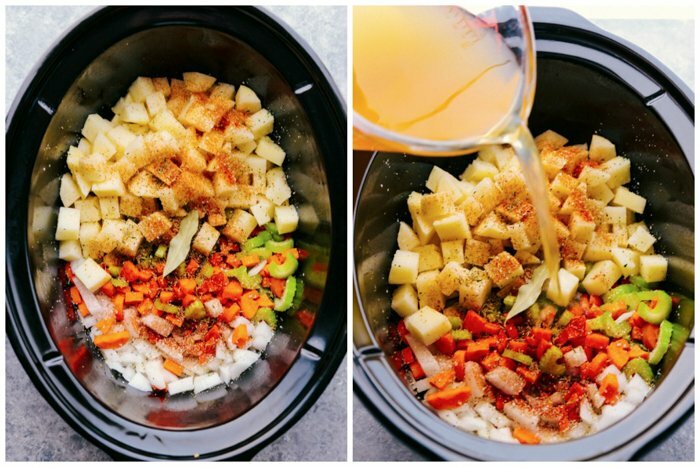 Transfer to crockpot along with peeled, cubed potatoes and seasonings. Pour chicken stock over the top and mix. Cover and cook on low for 3 hours. Stir in corn, milk, and cornstarch roux and cook one hour longer. Using a potato masher, mash up potatoes and vegetables to thicken soup. 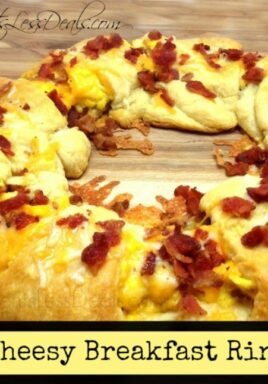 Garnish with bacon, chives and pepper. What Do You Serve With Corn Chowder? Some great choices to serve with corn chowder are corn bread, a classic green salad, cheesy bread or cheese biscuits with garlic butter, or serve it in a bread bowl so the whole meal is edible. How To Thicken Corn Chowder? If you are looking for a thicker soup you can use flour, cornstarch, or another thickening agent that will turn your soup into a creamy consistency with a denser texture. Make sure to mix the thickener of choice with water, broth, cooking wine, etc. to prevent it from clumping which will allow it to dissolve into the soup easier. Corn chowder is a delicious and creamy soup that is perfect for those fall days when you wrapped up in a cozy blanket binging on Netflix. 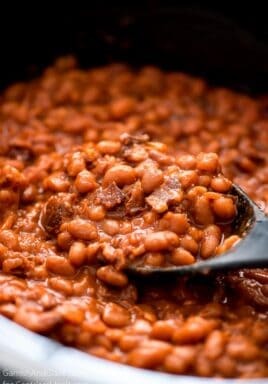 One of the great things about this recipe is although being cooked in a crockpot it won’t take all day to cook. How Can You Make Corn Chowder Easy? You can make life easy and prepare this corn chowder the night before. All you have to do is cut up the carrots, celery, and onions and place them in a sealable container. Then, peel and cut the potatoes into cubes and cover them with water. Refrigerate everything, ready for the next day. 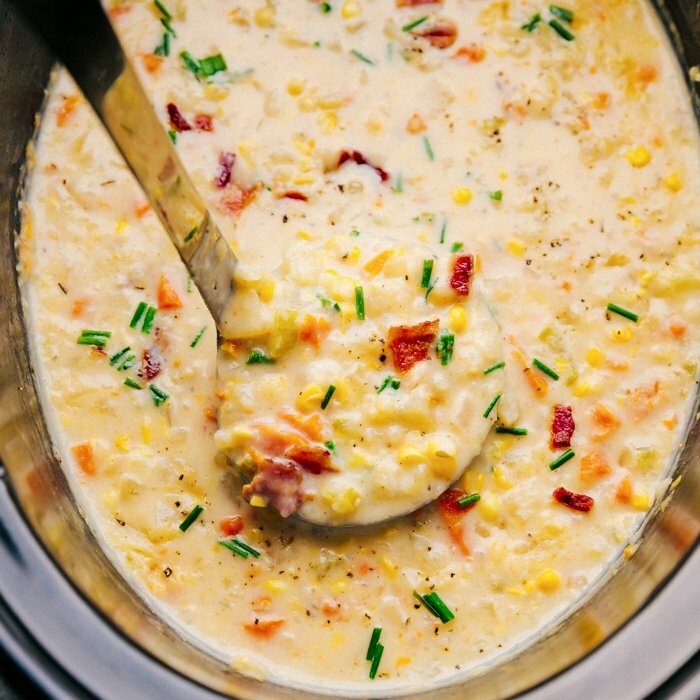 Crockpot corn chowder topped with bacon has always been a family favorite and is one of my go to crockpot recipes on the weekends when I want to spend as little time in the kitchen as possible. Ham and Potato Soup – hearty and filling! Crockpot Corn Chowder is the perfect soup for keeping you warm, filling your up, and tasting delicious. Full of corn, potatoes, and vegetables and topped with crispy bacon each bite gets better and better. 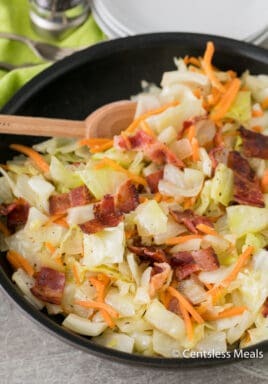 In a skillet over medium-high heat add canola oil and sauté carrots, celery, and onions until tender, about 5 minutes. Transfer to 6qt crockpot and add potatoes, chicken stock, garlic salt, thyme, paprika, bay leaf, and pepper. Cover and cook on low 3 hours (high for 1.5 hours). Stir in corn, milk and (make a roux with cornstarch and water) cornstarch mixture. Stir and cook one more hour. Using a potato masher, mash potatoes and vegetables to thicken soup (you can mash as much or as little as desired). Top with crumbled bacon and chopped chives.